With Spring Break behind us, we are all looking forward to summer plans. What will your summer hold? Many students find themselves in the same situation as Harold Hunt, 1954 Alumni and Retired Samford Theatre Department Chair. 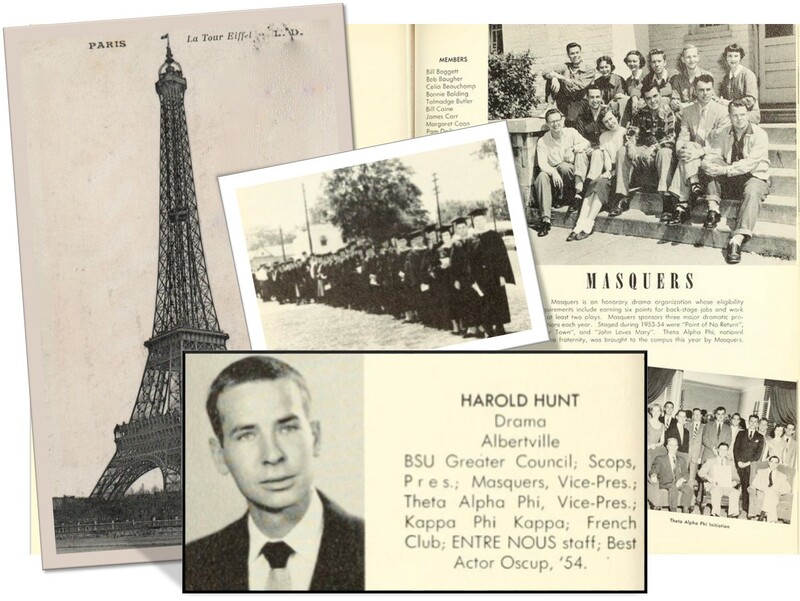 Just shy of the language credits needed to graduate Howard College in 1954, he and a handful of students set sail for Paris to immerse themselves in the French language, travel Europe by train, and for Hunt himself — to enjoy the last semester of college before being drafted to Korea. Read below an excerpt from an oral history interview with Hunt as he recounts what was most likely the first semester abroad for Howard College students. I transferred [to Howard College] . . . so I didn’t start French until my senior year and I had a year to go . . . the option was to stay in East Lake for the summer (you could take a full year in the summer), but several of us, . . . there were seven, maybe eight of us, that decided that it would be a lot nicer to go to Paris rather than East Lake. So we convinced Dean Percy Burns that we would learn more French if we were in Paris and convinced our parents. [Dean Margaret] Sizemore taught French and spent every summer in Paris. So seven of us got on a ship, completely unchaperoned, in Quebec, Canada and sailed to Paris, France. And the girls stayed in a facility [for] American university women, I think it is a national organization and they had a, like a Samford center type of thing in Paris. So the girls stayed there and the guys stayed in a small hotel nearby. We went to class and of course it was all in French. I wasn’t the best French student in the world to begin with, [but] somehow we got where we could kind of get around and we went to class and ran all over Paris. We planned to travel [around Europe]. I knew that the moment I set foot back on American soil I was going to get drafted so I waited as long as I could. So we mapped out this plan [for the] seven of us. At that point you could buy first class, second class, or third class tickets (you can imagine what 3rd class was like). But seven of us, with all this luggage, [got] on a train, and I can remember pushing suitcases through windows to get them all [on]. So we traveled and just did this circuit. And gradually, one by one, they would come home and I was left in England by myself for maybe a week or 10 days. I traveled up into Scotland and did a lot of things. All that sounds like it was a very wealthy kind of thing but it was very cheap to travel. Actually, there was a civic club, Kiwanis Club or something in Woodlawn that [gave] us a loan. [It was] a student loan and I think mine was just several hundred dollars that we would agree to pay back; and then my family [contributed]. My father said he had never been to Europe but he had wired money to every major city in Europe. He said, “I know that as soon as you get drafted you’ll be sent back to Europe” and sure enough I was. That was, as far as I know, the first student travel study. Adapted from Oral History Interview with Harold Hunt, January 4, 2013.